Because the body processes marijuana differently than alcohol, the traditional measurements won’t cut it, the commission concluded. That means no Breathalyzer or blood limit, and police should continue using roadside sobriety tests, at least until marijuana science and technology catch up to legalization, the commission found. Six other states with legalized pot have set a blood level for impaired driving. So the Michigan commission’s recommendations may be unsatisfying to marijuana proponents who pushed legalization on the premise it could be regulated like alcohol and for marijuana opponents who feared legalization would wreak public safety hazards on Michigan cities, including a rise in car crashes. “We want things to look like alcohol… the way that alcohol works with impairment and blood levels of alcohol is convenient” for measurement and enforcement, said Carol Flannagan, a professor at the University of Michigan who specializes in traffic safety and served on the Impaired Driving Safety Commission appointed by former Gov. Rick Snyder to research a THC limit and report back to the governor and Legislature. Critics say the lack of standards may give too much discretion to police officers, though they agree the state shouldn’t set standards without supporting science. The issue is one of many gray areas Michigan officials are navigating as the state transitions to legal recreational marijuana following voters’ approval of a ballot measure last November. It’s a world where regulations and scientific research are fumbling to catch up to consumers. Here’s a look at arguments that frame the issue. Unlike alcohol, there isn’t a direct link between how much of marijuana’s intoxicating component, THC, is in drivers’ blood and their level of impairment, said Flannagan. That’s because pot isn’t linear – there’s a spike in THC levels right after smoking that quickly drops to low levels even though users may feel high for hours, she said. Conversely, traces of pot can be found in users’ blood for days after their high. So super-stoned drivers can have little THC in their system, while others could be dead sober and show the same amount. That’s why the report recommends that if police suspect drivers are high, officers should perform the same roadside tests as for drunk drivers. Among them: Following a light or finger with only eyes; walking heel-to-toe along a line- and standing on one leg for 30 seconds. These standard tests have “mixed results” for detecting marijuana intoxication, the commission found, but they’re essentially the best option police currently have to test impairment on the roadside. “It’s a wise recommendation in the sense that science is really unsettled in this area,” said Muskegon County Prosecutor DJ Hilson, president of the Prosecuting Attorneys Association of Michigan. Do field tests give police too much discretion? That’s a “a legitimate concern,” said Brett Rendeiro, an attorney specializing in cannabis law at Butzel Long. On television, roadside tests involve stumbling drunks falling out of cars in front of police, he said. Flannagan, the UM professor, said the commission discussed concerns about police subjectivity “extensively.” Until cannabis-specific tests become more reliable, roadside tests are the best option, she said. In the meantime, the public should have faith in a system that is already used to prosecute impairment cases, she said. “It’s trust in the system, it’s trust in the test, it’s trust in the process,” Flannagan said. That’s all the more reason technology needs to catch up, Rendeiro said. “Communities that are historically marginalized or have concerns about police tactics, this is an area that would be of great concern,” he said. Given the amount of subjectivity, the report recommends state lawmakers invest in police training of stoned driving and research to improve testing technology. All police officers are required to be trained in the basic roadside sobriety tests, but only 20 percent have advanced training in detecting whether drivers have taken drugs, alcohol and combinations of both, the report says. Gov. Gretchen Whitmer “recognizes that there still needs to be a process in place to identify impaired driving and protect motorists, and she is ready to work with experts and her legislative partners to get it done,” her spokesman, Robert Leddy, wrote in an email to Bridge. House Speaker Lee Chatfield has not yet seen the report, spokesman Gideon D’Assandro said. Senate Majority Leader Mike Shirkey did not respond to requests for comment from Bridge. 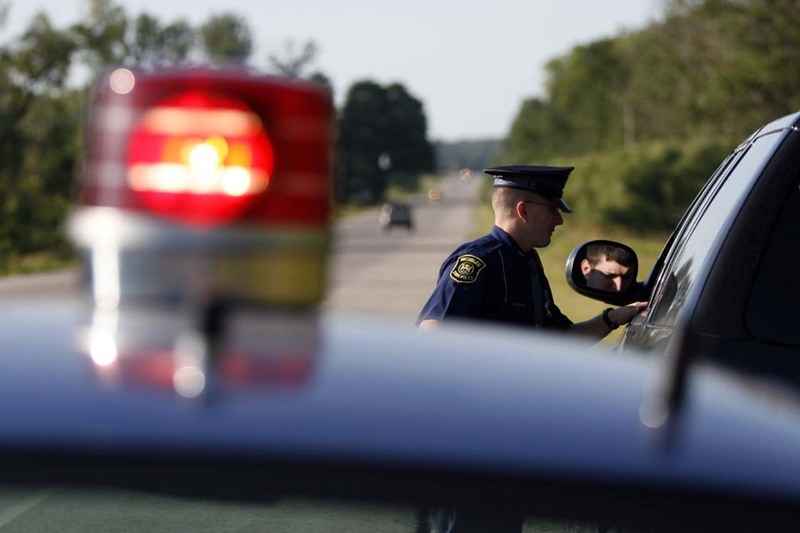 The Michigan State Police have piloted a roadside spit test for marijuana and other drugs that is promising, Flannagan said. The test is better at determining whether someone used marijuana recently, which would help reduce the chance cops arrest someone who is sober but shows THC blood levels from previous use. Entrepreneurs in California have also developed a roadside breath test that promises to measure whether someone used cannabis recently. It’s being tested by a few police departments in the region. “It’s been hard to do research on marijuana because of its status as an illegal drug. So I have some hopes that we can get somewhere” now that it is legal at the state level, Flannagan said. Because everyone metabolizes marijuana differently, there’s no clear guideline such as the one-drink-per-hour rule for alcohol, said Flannagan. Being high on marijuana has been proven to muddle critical driving skills such as reaction time, judgment, anticipation and attention, the report says. The best rule: Don’t risk it, said Robert Stevenson, executive director of the Michigan Association of Chiefs of Police. “Don’t smoke and drive. Don’t take a chance with somebody else’s life or your own,” he said. The problem is THC can remain in the bloodstream for up to 90 days after use. In other words, your blood test would show positive for THC for weeks even though you haven't used recently. could you possibly mean metaboites in your statement as opposed to THC. There is also the fact that is not brought up in this article that drivers don't have to take "field sobriety tests" And they never should. There is no law that says u must. Breathalyzers yes. Sobriety tests no. It is worth noting that alcohol is the only substance for which Michigan has a "legal limit" established for intoxicated driving. There are countless other substances that can impair one's ability to drive, including over-the-counter (OTC) sleep aids, decongestants, pain medications, etc., and there are many prescription medications that can severely impair the ability to drive. Consider the current opioid crisis and the number of people who may be lawfully taking those prescribed substances, albeit with label warnings about driving, operating machinery, etc., yet there is no "legal limit" established for driving under the influence of any of these substances. That has not precluded prosecuting a driver whose ability is impaired by any of those substances. The established legal limits for alcohol simply create a "presumption" under the law. In other words, if someone's blood alcohol level is above a certain level they are presumed, by the law, to be under the influence, or impaired (a lesser level of intoxication). This presumption has existed for decades, but many drunk-driving arrests have been prosecuted without evidence of a person's actual blood alcohol level. These prosecutions are based upon observations of the driver's condition, demeanor, odors of alcoholic beverages on his or her breath, field sobriety tests, etc. Prosecutions for operating under the influence of any other substances can be pursued in a similar manner. If there is no evidence of substance use, whether observed or measurable (i.e. with a chemical test), but the driving (the reason they were stopped in the first place) posed a danger to the public, a charge for reckless driving may be appropriate. That has happened many times when a person's driving was clearly dangerous but there was little or no alcohol measured by a breath or blood test. Stoned driving - whether from marijuana or other OTC or prescription drugs - can be successfully policed and prosecuted without an established legal limit. If you're reckless driving I don't think the police or courts should worry about what you were abusing when you got behind the wheel. Being reckless was enough to get their attention. I remember when driving was a privilege you earned then protected like your life depended on it. I wish I could be more positive about what's waiting for me out on the road today. When society added alcohol, cell phone, prescription med and marijuana abuse to the mix, I had hopes that the disintegrating roads would at least get better. Hang on to your hats, I think it's going to be a bumpy road. Instead of subjective measurement by police, how about an objective measure of impairment? My DRUID app assesses cognitive-motor impairment in 2 minutes, measuring reaction time, hand-eye coordination, balance and the ability to perform divided attention tasks--it is called DRUID (an acronym for “DRiving Under the Influence of Drugs”) available now in the App Store and in Google Play. DRUID statistically integrates hundreds of data points into an overall impairment score and takes just 2 minutes. The first peer-reviewed journal article validating DRUID is here. Dr. Millburn: Thank you for your worthy reply. Legalization without measurable limits is just opening a Pandora's box for the state, which didn't think through the consequences of legalization. Testing has go be cognitive-motor since the quantities of THC in the blood are unreliable predictors. I hope someone in the legislature is interested in taking this on . How is it possible that people with 4,5,6, plus arrests for DUIs still be behind the wheel.?????????? R.L. It's not like stoned drivers are new to MI or the police. They have been busting and convicting them for longer than the 45+years I have been alive. Why now are they having a problem? Have peoples eyes stopped getting bloodshot? Stoned drivers aren't even the problem. They told us the same thing when medical cannabis was passed and what PSA's have we seen over the last 10 years? Those asking people to take the NO TEXT pledge. If you want to be legal, you currently have to wait 12 hours after partaking in any medical or recreational usage. Maybe that would be appropriate for some edibles, but after smoking or vaping, that is ridiculous. Most people who are going to use are going to do so at least somewhat responsibly. Just like they do alcohol and prescription drugs. I can't same the same for sober texters or phone users though. Or just your plain ol'e driver who thinks they own the road. Careful out there. The accident you get into and need insurance for probably won't be your fault.